Our April mix contains brand new tracks from Rotterdam-based electronic artist Nadia Struiwigh (taken from her sublime Denovali full-length ‘WHRRu’; Grouper’s achingly beautiful and powerful studio album ‘Grid Of Points’; more new Kranky releases from the peerless Brussels-based ambient composer Christina Vantzou and California-based Dedekind Cut; the shape-shifting self-titled studio album from Bolivian American electronic composer Elysia Crampton; Inga Copeland’s latest musical venture under the alias of Lolina and Strut artist Idris Ackamoor & The Pyramids. Also featured is the renowned Brooklyn music institution RVNG Intl: London-based cellist and composer Oliver Coates’ brand new techno-fuelled single – and first for RVNG Intl – ‘Charlev’ with a full-length due out later this year. Another new RVNG release is renowned Colombian-born composer Lucrecia Dalt’s bewitching new record ‘Anticlines’, containing immaculate contemporary electronic compositions interwoven with cinematic spoken word passages (released this Friday, May 4th). Irish artists include: Cork-based trio Crevice who creates hypnotic darkwave infused ambient song cycles and renowned Dublin-based composer Seán Mac Erlaine’s essential third solo full-length ‘Music for Empty Ears’ (recently released on the Ergodos label). This April marks the beloved U.S. band Mercury Rev’s 20th Anniversary tour of their classic “Deserter’s Songs” album (including an extensive Irish tour, UK and Belgium shows). We had the honour to recently interview Mercury Rev frontman Jonathan Donahue (soon-to-be-published) and an excerpt of this interview is featured in this month’s mix. Our March mix contains two exclusive tracks from the compelling German independent label Denovali Records. New Zealand’s Alicia Merz (under her Birds Of Passage moniker) unveils her fourth full-length “The Death of Our Invention” with a beguiling collection of dark pop song cycles embedded deep within a lattice of mimimal ambient soundscapes (released on 6th April 2018). The prestigious Rotterdam-based electronic producer Nadia Struiwigh has carved out a shape shifting ambient techno voyage with her Denovali debut full-length “WHRRu” (Where are you) which will be released on 27th April 2018. Also featured on our latest mix is new music from the peerless Belgian re-issue label Stroom; Jonny Greenwood’s “You Were Never Really Here” score; Grouper’s Liz Harris; A Winged Victory For The Sullen and Paul de Jong (The Books). August’s mixtape features a pair of tracks from This Is How We Fly’s eagerly-anticipated second album “Foreign Fields”, due for release on 15th September 2017. The four-piece comprise the renowned musicians: Petter Berndalen (drums), Nic Gareiss (percussive dance), Seán Mac Erlaine (clarinets, electronics) and Caoimhín Ó Raghallaigh (hardanger d’amore fiddles). Hailing from Ireland, Sweden and USA, the quartet draw upon a rich tapestry of sounds and traditions, drawing upon the raw energy and rich dynamism of jazz and its true spirit of improvisation, together with traditional music’s eternal affinity and appreciation for honing and perfecting one’s craft. “Foreign Fields” is a joy to behold, its soul-stirring music navigates new sonic terrain while continually pushing its four composers to reach for new heights, forever onwards and upwards for this most inventive and mythical of bands. UK producer James Holden’s “The Inheritors” (Border Community, 2013) was one of this century’s finest records, an album for modern times created by one of the most consistently innovative and singular artists making music today. With the announcement that it’s long-awaited follow-up, “The Animal Spirits” (due for release on 3rd November once again via Holden’s own Border Community label), it is bound to rise to the surface on many an end-of-year lists come December. The album (described as “synth-led folk-trance standards”) features Holden’s newly assembled group of “fellow travellers”, James Holden & The Animal Spirits. The personnel comprises long-time collaborators Tom Page and Etienne Jaumet, as well as Marcus Hamblett, Liza Bec and Lascelle Gordon. The album’s lead single, “Pass Through The Fire” has so far been unveiled, the track having been inspired by his 2014 trip to Morocco to work with late Gnawa music legend Maalem Mahmoud Guinia. James Holden was also recently added to the special guest curatorial program at this November’s Le Guess Who? Festival at Utrecht, where he has invited such stellar musicians as Serbia’s Mario Batkovic and Canada’s Jerusalem In My Heart to his lineup. August’s mix also features new releases from: Julie Byrne’s “Not Even Happiness” (Basin Rock); Four Tet’s latest essential single for his Text imprint, “Planet”; Grouper’s new track “Children” (taken from her “Ruins” album sessions); Rafael Anton Irisarri’s mesmerising “The Shameless Years” (Umor Rex) and Hype Williams’ “Rainbow Edition” (Big Dada Recordings). Compiled by Fractured Air, August 2017. The copyright in these recordings is the property of the individual artists and/or record labels. If you like the music, please support the artist by buying their records. We are delighted to present to you a special guest mixtape compiled by the world-renowned Boston Massachusetts-based songwriter Marissa Nadler. 2016 saw the release of Nadler’s latest masterpiece, “Strangers”, released via Bella Union (UK) and Sacred Bones Records (USA). “Strangers” finds Marissa Nadler’s sonic palette expanding (synths and drumbeats are at times added to Nadler’s voice and guitar). But despite the added instrumentation and more intricate arrangements, a purity forever remains in the treasured songbook of Nadler’s forever timeless oeuvre. Beautiful subtleties exist within the sonic tapestries while striking imagery such as disintegrating cliffs, towering skyscrapers, darkening woods and deep rivers are offset with characters often feeling at odds with the world they find themselves in (or more accurately find themselves suspended into, all of a sudden). There’s a tangible sense of contrasting dichotomies lying at the heart of “Strangers” (between the familiar and the unfamiliar; safety and danger; darkness and light; life and death) which makes the journey Nadler takes us on all the more real. Tangible. Life-affirming. And like a silent witness we can quietly navigate that darkness with her. For we are not strangers after all. ‘Strangers’ is out now on Bella Union (UK) & Sacred Bones (USA). Compiled by Marissa Nadler, 2016. The copyright in these recordings is the property of the individual artists and/or record labels. If you like the music, please support the artist by buying their records. Welcome to our final mixtape for 2016. For our last mix we are really excited to share an exclusive first listen of the forthcoming album by Finland’s The Gentleman Losers. Based in Helsinki, The Gentleman Losers comprise the brothers Samu and Ville Kuukka. The duo have released their music on such independent labels as Büro, City Centre Offices, Warp, Nothings66 and Standard Form. Their two full-length releases – 2006’s self-titled debut album and 2009’s sophomore “Dustland” – have been universally acclaimed, winning the hearts of many esteemed music-lovers worldwide, while also being championed by such independent music stalwarts as Germany’s Nils Frahm and UK’s Bibio. The forthcoming third record – the brothers’ latest venture into blissful instrumental music of unknown pleasures – is set to be released during 2017. December’s mix also features our favourite album of the year: “Upstepping” by UK cellist and composer Oliver Coates. As well as releasing his second solo album earlier this year (via PRAH Recordings) Coates has also released the sublime collaborative work “Remain Calm” (with Mica Levi of Micachu & The Shapes) via the UK label Slip Discs. In addition to a busy schedule of extensive touring and live performances during the year, Coates also performed strings on the current Radiohead album “A Moon Shaped Pool” (XL Recordings). Other 2016 favourites are featured here, including: Brigid Mae Power (self-titled LP via Tompkins Square), Carla dal Forno (“You Know What It’s Like” via Blackest Ever Black), Kevin Morby (“Singing Saw” via Dead Oceans), Jessy Lanza’s “Oh No” (Hyperdub), Kaitlyn Aurelia Smith’s “EARS” (Western Vinyl), Amiina’s “Fantômas” (Mengi) and Eluvium’s “False Readings On” (Temporary Residence). In a year that has all too often thrown up troubling and distressing news and events, it places an even brighter spotlight on the vital role – in expressing emotions, articulating thoughts, distilling messages, blurring boundaries and lighting the way – that music brings to all our lives. In our tiny capacity, we’d like to thank all the musicians, labels and listeners for helping to keep that eternal light flickering. Wishing our readers and listeners a very happy Christmas and peaceful new year. Compiled by Fractured Air, December 2016. The copyright in these recordings is the property of the individual artists and/or record labels. If you like the music, please support the artist by buying their records. ‘Sonnet’ is the fifth Kranky album by Thomas Meluch under his musical alias Benoît Pioulard, following the 2006 debut full-length ‘Précis’, ‘Temper’ (2008), ‘Lasted’ (2010) and 2013’s ‘Hymnal’. The American sound sculptor – in a similar fashion to his label-mates Loscil, Grouper and Pan American – has amassed a rich body of empowering work, seamlessly creating some of the most affecting and captivating ambient-based compositions of the past decade. This year has also marked the release of ‘Noyaux’, a four-track EP released on Morr Music and the collaborative project with longtime friend and colleague Kyle Bobby Dunn under the moniker of Perils (the debut self-titled LP was issued by Desire Path Recordings). 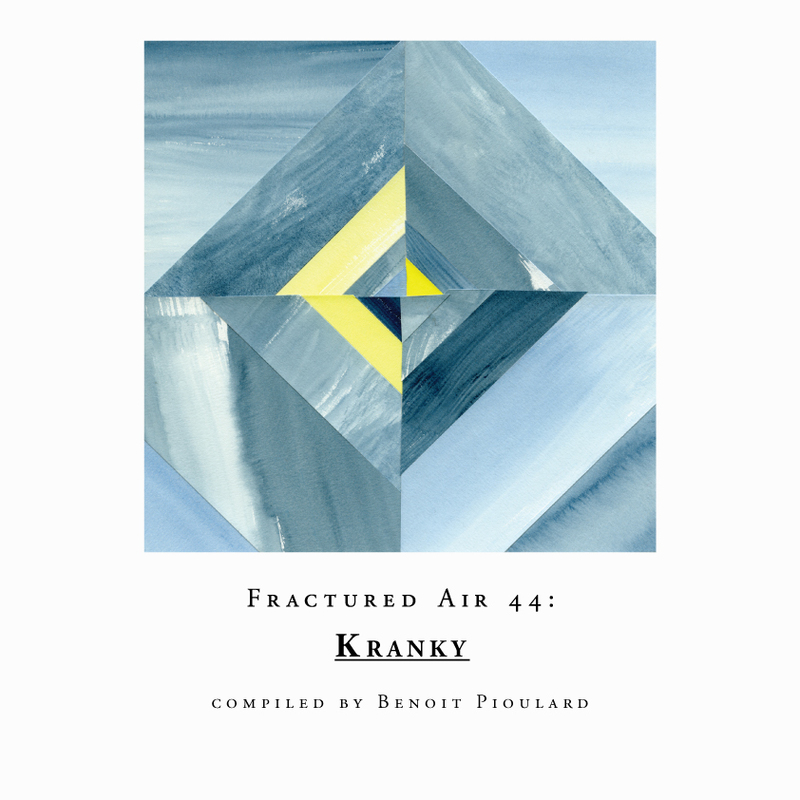 Kranky is an independent record label based in Chicago, Illinois. The prestigious label’s first release was Labradford’s debut album ‘Prazision’ in 1993. Some 22 years later, the label continues to release some of the most compelling and adventurous sounds from the likes of Loscil, Stars Of The Lid, Pan American, Grouper, Benoît Pioulard, Implodes and much more. 2015 has already seen latest releases from Benoît Pioulard, Disappears, Ken Camden, Valet, Helen and Christina Vantzou. Compiled by Thomas Meluch (Benoît Pioulard). The copyright in these recordings is the property of the individual artists and/or Kranky. If you like the music, please support the artist by buying their records.